For anyone who thinks The Rolling Stones are over-rated I can only say, “You stupid, stupid wanker”. To deny them of greatness just because you don’t appreciate their music is like criticising Picasso because you don’t understand cubism. Seeing them perform live is something I never thought they would live long enough to happen, even after their cancellation in March. Keith Richards should have keeled over ten times by now with the life he’s lived. And some thought that now in their early 70s, The Stones might not be as sprightly on stage as they once were in their prime. Wrong. Mick Jagger still moves better than any teenybopper, slick-haired douche bag you see grinding at the MTV Music Awards. And they’ll probably out-live every one of them. As they say, legends never die. A deafening opening montage had old-school fans screaming until they coughed up their smokers’ lungs. 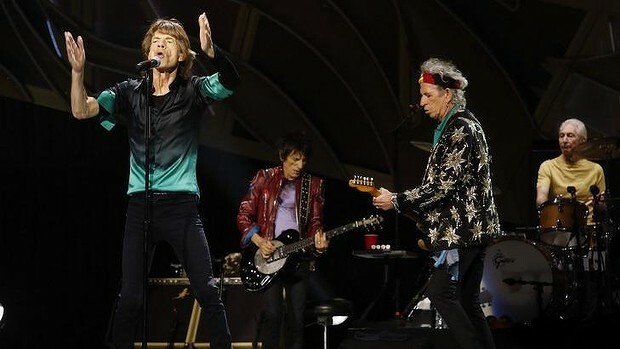 Mick, Keith, Ronnie and Charlie exploded on stage to bust a little Jumpin’ Jack Flash. Admittedly, they were slow to start but as the song goes, time was on their side (unfortunately not in the set list). They followed with hit after hit from their impressive 52-year career. Tumbling Dice, Wild Horses, Street Fighting Man (Melbourne’s song vote winner), Honky Tonk Woman, Midnight Rambler (with Mick Taylor) and Miss You were all accounted for. Keith Richards took over vocals for his usual two-song intermission. He was a bit bulgier than usual around the belly, but he could still wail. The reason The Rolling Stones have endured all this time is because no member is better than the band as a whole, and they know this. Each has his own irreplaceable traits and they play to them on stage – Jagger is a true showman, working the crowd with his trademark swagger, Richards’ heart still beats to the music and he enjoys bouncing off his fellow musicians. Even as he was lighting a cigarette with every song, Ronnie Wood enjoyed every moment on stage, while poor Charlie Watts looked like he could be sitting on a train instead of in front of 50,000 screaming fans, unmoved by the whole debacle. Lisa Fischer has been their back-up singer since 1989 and it’s not hard to see why she’s a good fit, her vocals on Gimme Shelter sent a tingle down your spine. The final act was when the band hit full stride; playing all the songs you wanted them to play, ending the set with Start Me Up, Sympathy for the Devil and Brown Sugar. It didn’t take long for the encore, joined by the Consort of Melbourne to open You Can’t Always Get What You Want. They then brought the house down with (I Can’t Get No) Satisfaction. Tickets were ridiculously priced for this gig and I feel bad for true fans who couldn’t justify spending that much or just missed out, because honestly it’s not often money can buy you an experience like that.